The capsule carrying daredevil Felix Baumgartner launched off the ground Sunday, Oct. 14 at 11:30 a.m. EDT, carried up by a giant balloon, in preparation for Baumgartner's attempt to make the highest skydive ever. An Austrian daredevil has begun ascending toward the stratosphere in a giant balloon, kicking off his attempt to break the world record for highest-ever skydive. Felix Baumgartner's 55-story balloon lifted off from Roswell, N.M. at 11:30 a.m. EDT (1530 GMT) Sunday (Oct. 14), carrying the daredevil inside a custom-built 2,900-pound (1,315 kilograms) capsule. If all goes according to plan, the balloon will rise to an altitude of 120,000 feet (36,576 meters) over the course of several hours. Then Baumgartner will step out of his capsule, nearly 23 miles (37 kilometers) above Earth's surface. He'll plummet through the stratosphere in a harrowing 5.5-minute freefall that will see him become the first skydiver ever to break the sound barrier, then deploy his chute and float safely to the desert floor. 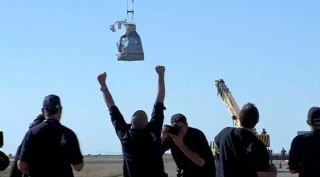 You can watch the 43-year-old daredevil's record-breaking plunge live here at SPACE.com. "You're on your way to space," Joe Kittinger, current record holder for highest skydive, told Baumgartner as his capsule ascended. Kittinger is serving as an advisor on today's mission. "Roger, Joe," Baumgartner replied. "It's looking good up here." The balloon carrying daredevil Felix Baumgartner ascends to begin his attempt to break multiple skydiving world records. "I will be proud to be the first person to break the speed of sound in freefall," Baumgartner said in a Red Bull interview this weekend. "But really I know that part of this entire experience will help make the next pressure suit safer for space tourists and aviators." Baumgartner should also notch a few other records in the process, including longest-duration freefall and highest manned balloon flight, say officials with his mission, which is called Red Bull Stratos and is sponsored by the energy drink company Red Bull. Baumgartner is aiming to break a skydiving mark that has stood since Kittinger, then a captain in the U.S. Air Force, leapt from 102,800 feet (31,333 m) back in 1960. "I have been working towards this goal since I was a little kid when I started looking up to people like Joe Kittinger," Baumgartner said. "And with him on my team, I know I am surrounded by the best in the field." Today's launch comes after two previous liftoff opportunities — one on Monday (Oct. 8) and one on Tuesday (Oct. 9) — were scuttled by gusting winds. Even moderate winds can damage the balloon, which is huge but fragile, Red Bull Stratos officials have said, and the team won't launch if winds at the staging ground exeed 2 mph (3.2 kph). Baumgartner has been working up to today's leap in a stepwise fashion. He jumped from 71,581 feet (21,818 m) this past March and then dove from 97,146 feet (29,610 m) on July 25. Red Bull Stratos officials have referred to the mission as a jump from the edge of space, but this is perhaps a bit of an exaggeration. Space is generally considered to begin at an altitude of 62 miles (100 kilometers), or about 327,000 feet (though the U.S. Air Force awards astronaut wings to pilots who fly above 50 miles, or 80.5 km).